I was fortunate to watch Piers Morgan's interview with Governor Chris Christie of New Jersey last night. As we know, Hurricane Sandy hit New Jersey and several other states very hard, and the devastation is widespread. Governor Christie gained another fan (me) when he answered Piers' questions about how children might be affected by this hurricane. And I'm so glad that the topic came up (thank you, Mr. Morgan). Let's all remember the children who are suffering now because they live in the path of that hurricane, and also remember those kids that have watched the news unfold on television. Here are a few statements from the interview transcript. MORGAN: You have a young family, are they all OK? Where were they when all this was going down? Was it at the family home? And what do you say to your children? What does any parent say to a child when this kind of catastrophe happens on their doorstep? 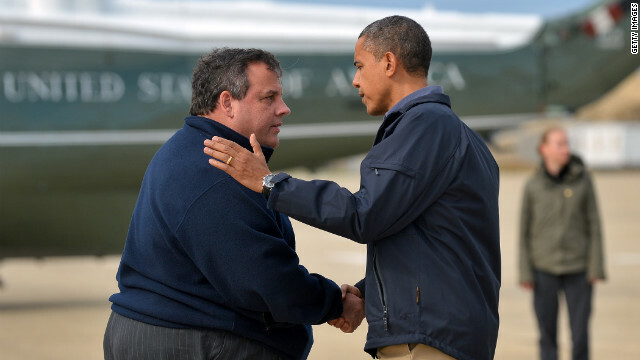 CHRISTIE: Well, first off, you give them a hug and you say don't be scared, mom and dad will protect you. That's the first thing you do. And second, my family was at our family home in Mendham when we lost power finally late yesterday afternoon. The state police moved them down to the governor's residence in Princeton, where once we arrived, we shortly thereafter lost power there as well. But at least we were all together and I came from the operations and intelligence center last night over to the governor's residence and we spent the night together there last night. And we'll spend the night together there again tonight. CHRISTIE: No power but at least we'll be together. MORGAN: What would you say -- what does a parent say, what should parents be telling their kids in New Jersey now? CHRISTIE: I think they look at their children and, you know, children are obviously scared about this. So I said this in my press briefing the other day, I said -- spoke directly to the kids of New Jersey and said, don't be scared. The adults are taking care of this problem. We will take care of this problem. We will keep you safe. That's the most important thing. Kids want to know if they're safe. First and foremost. And I don't think the message should be any more complicated than that. This is an adult problem for adults to solve and cope with. And we should just let -- lower children's anxiety by telling them that the adults in their lives will keep them safe, and there's nothing to be scared of. This is such good, practical advice for parents, grandparents or responsible adults looking for the right answer to give an anxious child.